Founded in 1988, N. K. P. Pharma Pvt. Ltd. was just another pharmaceutical packaging Machinery manufacturing company that dotted the country. What made us different was our hunger to grow to be the best and to provide value to our customers through innovation and service. Our research expertise is both wide and deep, our team of design engineers has long years of experience in the field and have successfully solved a number of challenges set to us by clients. We also take initiative and develop our own ideas a number of which have also converted into products. 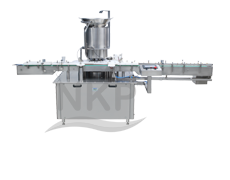 NKP Pharma is a world leader in the field of designing and manufacturing pharmaceutical packaging machineries. Our wide ranges of pharmaceutical machineries are equipped with most advanced features for broad spectrum of industry applications. 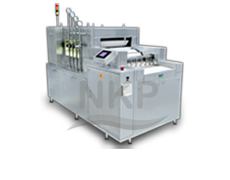 “NKP” deals in complete range of packaging machineries right from Vial Washing Machine upto Labelling Machine for Injectable Dry Powder , Injectable Liquid for Vials & Ampoules and Dry Syrup Powder Filling Line. Our automatic linear vial washing machine is available in different models as per the standard and custom requirements. 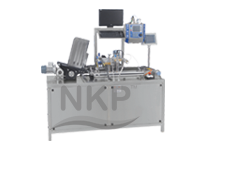 Injectable dry powder filling with rubber stoppering machine and double head auger type dry syrup powder filling machine from NKP are highly accurate and used for various sizes of vials and bottles. 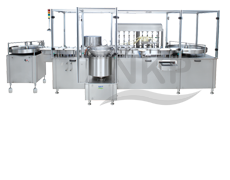 Injectable liquid filling with rubber stopper machine, vial sealing machine, external vial washing & drying machine, Vial inspection machine, self adhesive vertical labelling machine, offline carton coding machine with inspection and rejection system are some of our pharma equipments highly demanded in India and across the globe. We also cater variety of Pharmaceutical accessories including swing conveyor, fix conveyor, lifting device, swing type wire mesh conveyor and many more at the most attractive rates to our worldwide clients. 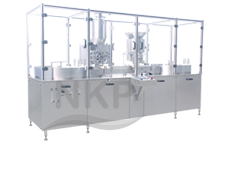 We are dedicated to provide best technology Pharma machines with industry best services. Our equipments are manufactured from sturdy raw materials to work for longer duration with low maintenance. We focus more on our client satisfaction with the best usages of our machines. 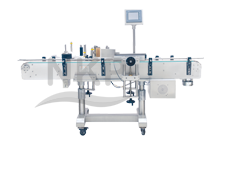 If you are looking for Pharma Packaging Machineries, we will be the one stop solution for all your pharmaceutical packaging needs.